Melvyn Bragg and his guests discuss the Etruscans, an ancient civilisation which flourished in central Italy for five hundred years before the emergence of the Roman Republic. Melvyn Bragg and his guests discuss the Etruscan civilisation.Around 800 BC a sophisticated civilisation began to emerge in the area of Italy now known as Tuscany. 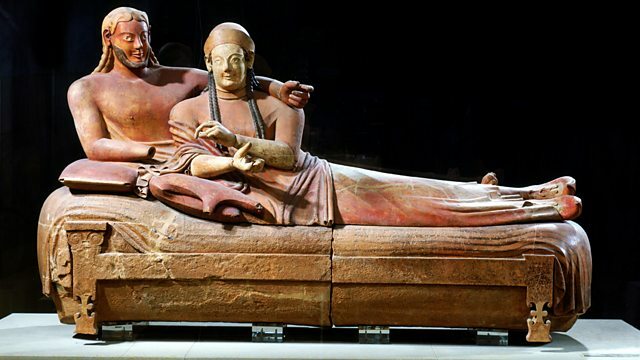 The Etruscans thrived for the next eight hundred years, extracting and trading copper and developing a sophisticated culture. They were skilled soldiers, architects and artists, and much of their handiwork survives today. They are also believed to have given us the alphabet, an innovation they imported from Greece. Eventually the Etruscan civilisation was absorbed into that of Rome, but not before it had profoundly influenced Roman art and religion, and even its politics.With:Phil PerkinsProfessor of Archaeology at the Open UniversityDavid RidgwaySenior Research Fellow at the Institute of Classical Studies at the University of LondonCorinna RivaLecturer in Mediterranean Archaeology at University College London.Producer: Thomas Morris.